Making Those Thanksgiving Green Beans Exciting Mollie Katzen, author of The Vegetable Dishes I Can't Live Without, demonstrates from her kitchen in Berkeley, Calif., how to make her dramatically seared green beans. Says Katzen, "For a lot of people, it's not Thanksgiving without the green beans." 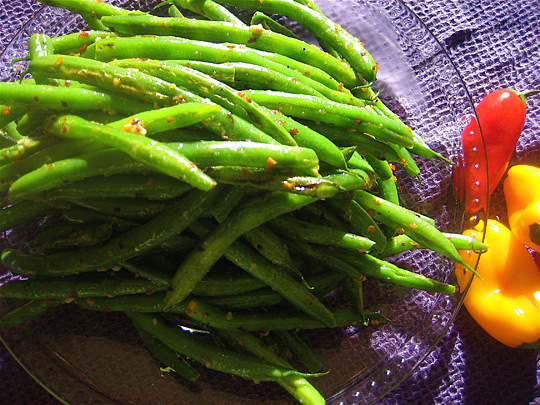 Mollie Katzen's seared green beans. Mollie Katzen, author of The Vegetable Dishes I Can't Live Without, demonstrates from her kitchen in Berkeley, Calif., how to bring searing drama to Thanksgiving vegetables this year. She demonstrates how to make her dramatically seared green beans because "for a lot of people, it's not Thanksgiving without the green beans." Katzen heats peanut oil on the stove top and drops the green beans in when the pan is really hot to seal the green beans' juices. She turns them with what she calls her favorite utensil — tongs that are spring-loaded — and adds salt, garlic and red pepper flakes. "This dish is great fresh out of the pan, but it's also really good at room temperature," Katzen says. "And I think the more options we have for food that doesn't need to be piping hot direct from the stove, the more relaxed the host can be."